Lady Dorothy Capel of Kew and Edward Colston of Mortlake left money for the ‘Charity School in the 18th century. Parents of Mortlake children had to pay, but education was free for pauper children in the workhouse. (The Workhouse was the building next to Mortlake Hall, now called Capel Court. When it was converted into flats in 1984, planners required that its outside appearance was not to be altered.) In 1819 part of the workhouse garden was used for the building of school premises. In 1843 the workhouse building was handed over for school premises. In 1890 the Duke of Fife and others gave money for the building of the Infants School which is now Mortlake Hall. Vestry records show that in 1865 there were 463 scholars; 528 in 1870; 790 in 1880 and 995 in 1890. Under the 1944 Education Act the school became a Local Authority Voluntary-Aided School. In 1984 because of falling school population in Mortlake the Local Authority closed the school. The site which extended down to North Worple Way was sold for housing to the Richmond Churches House Trust. 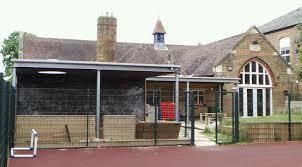 The Charity Commissioners allowed the Trustees of Mortlake Church of England Educational Foundation to retain the Infant School building and half an acre of land to be used for educational purposes. That is Mortlake Hall and its playground. On 27 November 2010, the Mortlake Hall Family and Children’s Centre was opened by the Mayor. This followed extensive building and refurbishment, making better use of the space available, but retaining the essential qualities of the Hall.